Thin Lizzy are an Irish hard rock band that started in Dublin in 1969. Up to 1984 the band were led by bassist, songwriter and singer Phil Lynott (1949-1986). The band's famous song "The Boys Are Back in Town" is still played a lot on classic rock radio stations. Since Lynott's death, other former members have carried on using the band name. Phil Lynott wrote most of the band's songs. 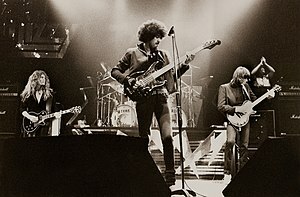 The band's music showed many musical styles including: country music, psychedelic rock, Celtic music and folk music which Lynott mixed with hard rock and heavy metal styles. Thin Lizzy were listed at number 51 on VH1's 100 Greatest Artists of Hard Rock. ↑ VH1 "100 Greatest artists of hard rock"
This page was last changed on 27 December 2015, at 23:01.